There are about a dozen metrics by which I judge 3D printers when testing them, including speed, noise and the materials with which they can print. But, none of the latter attributes compares in importance with a printer's ability to produce objects with precision and accuracy. It is in that one area that the new LulzBot Mini 3D printer excels. 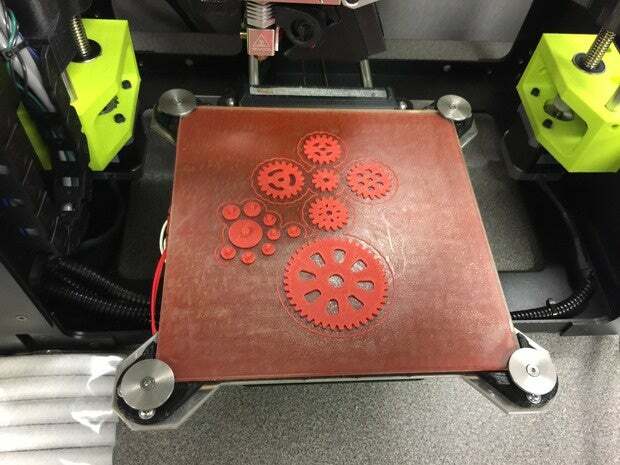 Gears and sprockets printed by the LulzBot Mini. Note the precision. Aleph Objects unveiled the LulzBot Mini at International CES last week. The machine will be available on Jan. 22 at a retail price of $1,350. The printer is "mini" in that it's smaller than previous LulzBot machines, though there are other 3D printers that are similar in size. However, at 17-in. x 13.4-in. x 15.2-in., the LulzBot Mini does fit nicely on a desktop, where other printers can often monopolize space. It also weighs just 19 pounds. The last "desktop" printer I reviewed, the da Vinci 1.0 AiO all-in-one 3D printer, nearly threw my back out when I pulled the 60-pound machine from its shipping box. Being smaller, the LulzBot Mini's build area is also more restricted than some other mid-range 3D printers. It offers an area of 6-in. x 6-in. x 6.2-in. The RepRap-style 3D printer presents an open, no-frills chassis compared with the da Vinci, or other printers from the likes of 3D Systems or Makerbot. Many other 3D printers are fully enclosed in handsome cases with transparent, hinged front doors; on the da Vinci, even the plastic filament came in a pop-in cartridge. In contrast, the LulzBot Mini uses an open reel of thermoplastic filament that hangs off a hook on top of the machine like a towel in a gym locker room. But it works just fine -- and isn't that what really matters? Like other RepRap-style printers (RepRap meaning it can print most of its own parts), the Lulzbot Mini uses open source hardware and open source CAD software. While simple, the LulzBot Mini offers a solid design with a riveted matte black steel frame. Another great feature on this printer is the plastic polyetherimide (PEI) film that covers the heated borosilicate glass bed. The PEI film helps objects adhere to the platform when heated, but once they are cooled, they easily detach. In fact, I've never had as easy a time removing something from a print platform as I did with this machine. Set up is simple. All that's required after removing the LulzBot Mini 3D printer from the box is to remove several blocks of protective styrofoam. Once that's done, just hang the spool of thermoplastic filament, feed it into the print head, download the open source software to your computer, connect the USB cord and you're ready to print. I had the machine up and running in about 15 minutes. 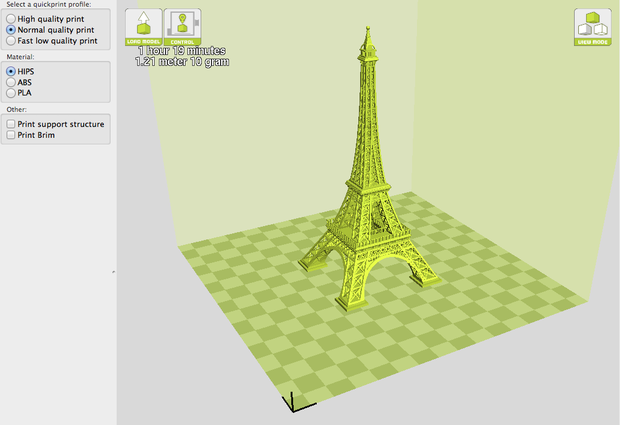 The Eiffel Tower as it appears in the LulzBot's CAD software (Cura). The first thing I printed was a small octopus trinket, the CAD design for which came on a USB stick from Aleph Objects. The octopus was roughly three inches in diameter and an inch high. The object printed in about a half hour. Believe me, in the 3D printer realm, that's fast. The printer comes with some incredibly handy and high-quality tools, including a sharp-ended spatula for removing objects from the print bed and a dental-style pick and brush for removing support material from printed objects. When it comes to resolution, or the thickness of print layers, this machine is outstanding. It ranges from just 0.05mm to 0.50mm (0.002-in to 0.020-in). Compare that to a $2,900 Makerbot Replicator desktop printer, which has a minimum resolution of .1mm or twice as thick as the LulzBot Mini. The software that controls the Lulzbot Mini, Cura, allows users to manually control the extruder and platform temperature and choose from three print qualities: High, normal and fast (or low quality). It also lets you add support structures to printed objects. 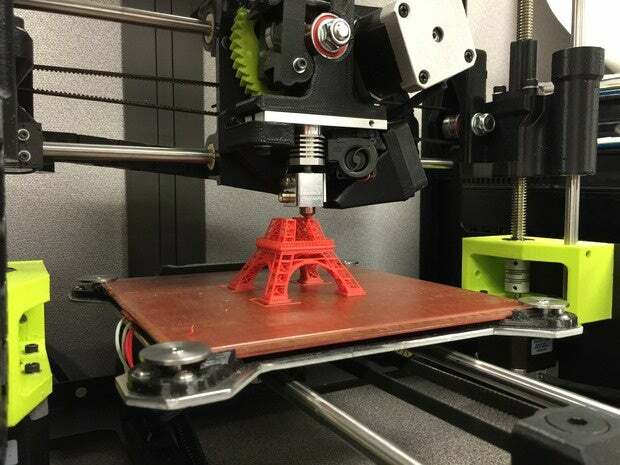 I've printed dozens of objects with 3D printers, but the one that has so far confounded them all is the Eiffel Tower. The reason previous printers failed to accurately create the tiny model is because it's filled with extremely thin and detailed latticework, from the superstructure of the legs to the cupola on top. To my surprise, the LulzBot produced the Eiffel Tower's details perfectly and quickly. The 5-in. tall model has taken as long as two hours on other printers. 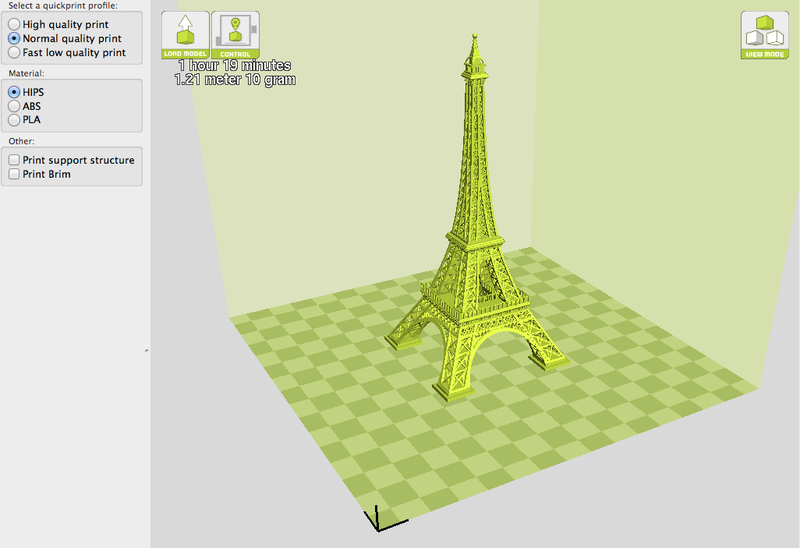 With the LulzBot, the Eiffel Tower model took one hour and 44 minutes to complete. The LulzBot Mini's version of the Eiffel Tower (center) far and away replicated the accuracy of the CAD drawing better than other machines I've tested. On the left is one printed on XYZprinting's da Vinci 1.0 AiO all-in-one 3D printer. On the right is the tower printed by Afinia's H-Series 3D printer. Now for some of the bad. This machine is not enclosed. While the mechanics do rest inside a steel cube, all four sides are open, meaning the annoying, trilly noise of the robotics, sprockets and belts assault you throughout a print job. And this machine is loud. Also, the LulzBot Mini has no onboard data storage. Many 3D printers have flash memory, which allows a maker to upload a CAD drawing to the machine and then disconnect the computer while the 3D printer continues its print job. Disconnecting your computer from the LulzBot Mini cancels the print job. There is no wireless connectivity. There's also no LED screen from which to choose various operations, as there are on many other mid-range desktop 3D printers. Functions like temperature control and filament loading and unloading is all governed through the Cura software you download onto your computer. At $1,350, this printer isn't cheap, but it is by no means expensive compared to popular machines sold by Makerbot and 3D Systems. The LulzBot Mini rests comfortably in the middle price range. For that price, the LulzBot quite possibly offers the greatest range of materials with which a consumer-grade 3D printer allows you to print. The printer can use popular thermopolymers such as ABS, PLA, HIPS, and PVA, as well as wood-filled filaments, Polyester (Tritan), PETT, bronze and copper filled filaments, Polycarbonate, Nylon, PETG, conductive PLA and ABS, UV luminescent filaments, PCTPE, and PC-ABS. For my review, I used HIPS and ABS, both of which are solid materials for building objects. What is also uncommon is that this 3D printer can run other vendors' software. While Cura LulzBot Edition comes standard, the machine is also compatible with OctoPrint, BotQueue, Slic3r (an industry standard), Printrun and MatterControl. While the price of the LulzBot Mini might place this printer out of the average person's budget, I believe any serious maker should consider this machine because of its flexibility, accuracy and speed.